One of the most difficult aspects of building with straw bales may be finding money to finance the project. Conventional lending institutions do not like to take big risks when lending their money. Something that is outside of their comfort zone is very quickly turned away. 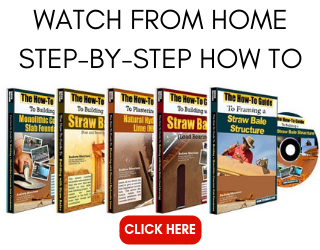 This has plagued straw bale builders and our clients for years. In order to be successful at acquiring funding from conventional sources, it is important to understand the common reasons banks site when turning down loan applications for straw bale construction. Because there are not an excess of straw bale homes in most communities, banks can easily say “sorry” simply because of this one issue. It is important to push the banker and/or the appraiser a bit further on this point. Comparable sales are exactly that, comparable. Bankers will tell you that straw bale homes are too unconventional. Great! Now you have found access to your appraisal homes. Anything that is considered unconventional is now a comparable sale that can be used for your appraisal. In most markets, this will include log homes, rammed earth, cob, structural insulated panels (SIP), other straw bales, adobe, insulated concrete form (ICF), and anything other than a simple stick framed building. Don’t let them get away with telling you there are no unconventional buildings in the area. The appraiser and banker only need three comparable homes. Do your own research to find them if need be. This is the biggest shell game the banks have. They tell you one thing when they mean another. It is so easy for them to say something is too far outside of their comfort level. After all, how can you argue with that, it’s their comfort level, not yours? The truth is, you can argue with that and you can win. A banker once told me that when you hear this, what is really being said is that you do not have enough capital to back up the loan. The same banker said he would loan me a $1 million to build a home out of matches if I had $1 million in the bank to guarantee the loan. Of course, if you have the money to build with in the bank, you probably won’t be out looking for a loan; however, you may be able to find someone who does have the money. Friends, family, and private investors are everywhere. Find someone to guarantee the loan and you will get your financing. Perhaps a family member will gift you the signature for free. If not, you can offer a small interest rate to the private money or family money lender. They do not have to put the money in an escrow account, simply have it available if you default on your loan. Their risk is not that high and there are ways to minimize their risk even further. The date of closing on a loan for the purchase of land and the construction of a home is very important. 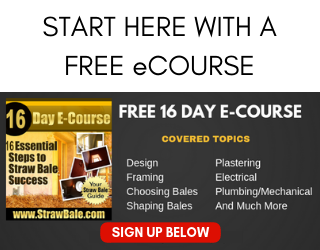 This may not affect you as much as it does the next person who wants to finance straw bale construction. 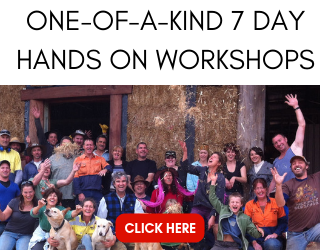 Let’s say you are buying a piece of land and intend to build a straw bale home. If you get a bank loan just for the land and close that loan before you build, you are not setting a precedent for the next comparable sale. If you buy the land, hold it in escrow, build your home, and then close escrow, you have created a comparable sale for the next person building with straw. The reasoning is that construction loans do not generate comparable sales. They are not considered sales, but rather straight financing for construction. If, however, you tie the construction to the purchase of a piece of property, you then create a sale of a straw bale home, even if you built it yourself for yourself. The more people who do this, the easier it will become to build with bales. Another great myth worthy of its own article! If a banker tells you that you won’t be able to insure the home and therefore they cannot give you a loan, you can confidently tell them that they are actual incorrect. Just like the banking industry, this is a snag for straw bale home builders and owners, but it is not a permanent snag. There are companies all over the United States that are willing to write home owner policies on straw bale structures. They can be hard to find, but they do exist, and they are reputable companies. In fact, there are companies in Arizona that actually discount premiums due to the high fire resistance of the structures! Do your research and you can successfully insure your home. If you still struggle with financing and/or insurance after employing all of the ideas you can conjure, you still have one last hope. If you are building an infill straw bale structure, you can change the wording on your building plans to eliminate the words Straw Bale. Very often it is simply the words that get the bankers stuck and not the reality of the home. If your plans say “Post and Beam frame with cellulose insulation” you are telling the truth and lowering the red flag words “Straw Bale”.  If you are building a load bearing structure, consider your walls to be a masonry unit. The new engineering shows that the structures are strong enough on their own to resist lateral and out of plane shear stresses with the proper construction. Therefore, your bales become the base for the masonry unit. The plaster, bales, and wire mesh constitute the masonry assembly. Work on your verbiage and this will minimize the red flags as well. Consider the difference between: “Load Bearing Straw Bale Wall” and “Approved Engineered Masonry Assembly”. Which one would you approve without question? This has been the technique employed for years. I would like to see people move away from it and be straight with the type of home they are building. Nonetheless, the immediate reality of your situation may dictate that you need to use this tactic. If so, fine. After your home is complete, the reality for the next person will be different as you will have created a conventionally funded comparable sale to help them along their way, as long as you time your closing properly!